Introducing the All New TiPb Forums! In today's From the Forums we'd like to introduce to you our new forum look and layout. First, you may have noticed our little name switch to TiPb and domain switch to tipb.com. Likewise, you can now find our forums at http://forums.imore.com! Second, with some new great Apple devices right around the corner it was time to change things up a little bit -- to help everyone find what they need faster and better. 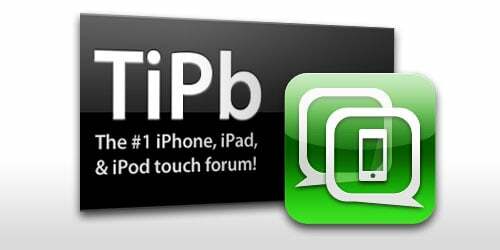 Third, we're doing a ton of great give-aways lately, and a lot of them happen right in the TiPb forums (like $260 worth of PowerMat last week, 10 Appigo Todo promo codes right now, not to mention our big iPad give-away coming up!). Becoming a member is a simple process that will only take a few moments of your time, so if you have not already already done so, head on over and register now! iPhone Forum: This is the place to go if you are in need of help, how-to guides, and any news and rumors regarding anything iPhone related. iPad Forum: Visit this forum to converse about all things iPad. Things including release news and feature rumors all can be found here. iPhone Jailbreak and Unlock: This forum is dedicated to all of your iPhone or iPod touch jailbreaking and unlocking needs. iPhone Apps and Games: Discuss iPhone, iPad, and iPod touch native App Store apps and games, and Web Apps. Share tips, tricks, and reviews. Jailbreak Apps, Games, and Themes: Here is the place to chat about jailbreak apps, games, and themes for your iPhone and iPod touch. Now that's not all, feel free to browse our other forums to find one that interests you! See you in the forums!